Are you leveraging the power of neuroscience to help your customers? Or are you putting customers into a brain state that is undermining your goal of keeping them coming back? Let’s take a quick assessment. 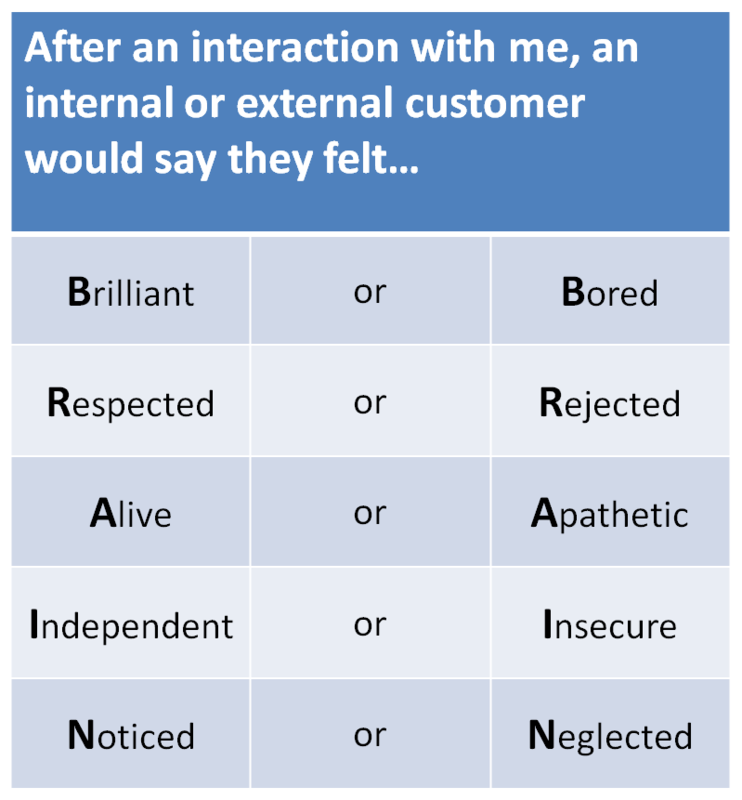 After an interaction with me, an internal or external customer would say they felt: A) Brilliant, Respected, Alive, Independent, and Noticed; or B) Bored, Rejected, Apathetic, Insecure, and Neglected. To move responses in a more positive direction, consider using a neuroscience approach. What would it take to help people feel brilliant, respected, alive, independent, and noticed? Here are five ways to get started. Brilliant: To feel brilliant, the pattern-seeking brain takes in millions of bits of information, seeking to connect them with other previous ideas and information. You can help people feel brilliant by making those connections—showing people how to connect what you are sharing to what they already know. For example, if you are selling a software solution, move beyond an early awkwardness with the new technology by sharing similarities to software the customer is already using successfully. Showcase the skill and brilliance that the customer already has. Alive: In today’s world, people zoom from one thing to another which often causes them to miss the fun, engagement, and joy of life. You can help rekindle the feeling of being alive for customers by being unique, being a bit vulnerable, or increasing your level of generosity of thought and practices. I was at major department store getting supplies for my college grad in his new apartment. The salesperson went beyond just pointing me to what I wanted and, instead, took a moment to ask who the purchase was for and what was happening with this new transition. Because of this interaction, I felt a renewed energy and focus for the rest of my day. One person has the ability to create a space in which someone else is renewed. You can be that person. Independent: Building competence in others is another great way to deepen relationships. Teach people how to use the products they are purchasing. Show them how to be successful. Building and reinforcing valued skills in others deepens neural connections. People love to learn new skills—it leads to increased independence. Noticed: To connect, you first have to notice. Use customer’s names. Stop and really notice who they are. If face-to- face, look at them. If on the phone, listen to what is not being said as well as what is being said. Remember that each person you interact with has a life journey, experiences, and rich knowledge different from any other person. Find out what is unique about your customers. Calling it out builds deep, permanent relationships by fulfilling the brain’s craving for relatedness. Apply the learnings from neuroscience to your customer service strategies. Use the BRAIN acronym to remind yourself (and others on your team) about the impact you can have when you help people bring the full capacity of their brain to the experience. Create connections that allow people to feel Brilliant, Respected, Alive, Independent, and Noticed for who they are and what they have done in their lives. It’s a great way to create a lasting brain bond with customers. Vicki Halsey is a senior consulting partner and one of the principal authors—together with Kathy Cuff—of The Ken Blanchard Companies’ Legendary Service training program. Infographic: What’s Poor Customer Service Costing You? After an interaction with me, a loved one, friend or customer would say they felt: A) Brilliant, Respected, Alive, Independent, and Noticed; or B) Bored, Rejected, Apathetic, Insecure, and Neglected.